From sending an email to powering urgent medical equipment, energy keeps America connected. The energy industry is diversifying in exciting ways as consumers explore new buying and distribution options. The Alabama-based Pea River Electric Cooperative is at the heart of innovation in the channel. To deliver reliable service for its 18,000 accounts, this member-owned, not-for-profit distribution cooperative is using advanced audiovisual tools for critical monitoring in its headquarters. 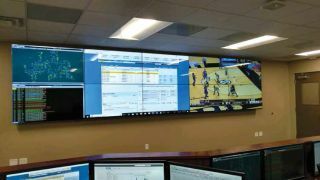 For a recent video wall and control system installation at Pea River’s headquarters in Ozark, AL, the value-driven cooperative turned to Encore Technologies, a subsidiary of Harris Security Systems, also based in Ozark. Encore’s deep expertise in all aspects of integrated audiovisual solutions was exactly what Pea River needed. LaDon Findley, Encore Technologies division manager and senior AV designer/estimator, has been specializing in AV systems for nearly 35 years. From state capitols to houses of worship, Findley and the Encore team bring passion to projects across the country. “We travel extensively and we do systems everywhere,” Findley enthused. But delivering a state-of-the-art solution for a neighbor in the Yellowhammer State was a win-win for all parties involved. With the Pea River video wall project in mind, Findley searched the halls of InfoComm 2017 in Orlando looking for potential fit. “I met the Datapath staff at InfoComm in Orlando,” Findley said. While the Pea River Cooperative HQ operators were aware of trends and new technologies on the market, they were hesitant to make a purchase. Many of the quotes they had fielded were surprisingly high, even “cost-prohibitive,” Findley said. After a quick software demonstration of the VSNMicro 600 at Datapath’s booth, Findley was impressed by the product’s intuitive operation and robust feature-set. And, the cost of the processor was “very reasonable.” The VSNMicro 600 platform includes a motherboard that is connected to Datapath’s Express6 PCIe backplane containing six half-length PCIe slots for use with Datapath’s range of cards. Available with a variety of options including an industrial-grade motherboard, Intel processors, DDR4 memory, and ATX or RSPU power supplies, the VSNMicro 600 is designed to offer the same rich feature set of larger VSN systems. The VSNMicro 600 is also compatible with Datapath’s portfolio of Vision capture, image graphics, and ActiveSQX IP decoding cards. Customers can build systems with myriad video inputs and IP streams that can feed to a large, multi-screen video wall. Pea River’s supervisory control and data acquisition system (SCADA) monitors the power lines and transformers throughout their area, and more specifically, their area of responsibility. When they have a power outage, lose a transformer, or a line goes down, a critical alert appears on the video wall as an alarm. A map instantly indicates the exact location of the issue. Findley also used Datapath’s ActiveConnect cables in this project. ActiveConnect are long-range fiber optic DisplayPort 1.2 and HDMI 2.0 cable, with lengths up to 100m. They require no additional power. While HQ operators at the call desk are seasoned professionals, the video wall is so easy to use that one doesn’t need a Ph.D to master it. Findley noted that there are two individuals that operate the system: one to field the service calls and one to dispatch the service after the call is made. The integration team implemented Extron control to further improve the user-friendliness with presets. With the 12-inch Extron touchscreen, operators can simply reach over, and with one touch, start the action. All it takes is a “one-button press,” Findley said, to activate the desired mode for video wall display. The video wall immediately jumps into that position. There is also no need to return to the rack or reconfigure to make the wall function as desired. Managers can simply touch the desired preset that activates stored themes. “It’s just a matter of touching the one that they desire and then the video wall acts accordingly and moves into that position with the images,” he said. The display solution in this control room is LG’s 55-inch super narrow-bezel LED displays with 700 nits. These flat panels offer remarkable brightness, fluid performance, 24/7 operation, and, according to Findley, are “very easy to watch…easy on the eyes.” The resolution, despite running at 1080p, is incredible. “It’s easy to read, no pixilation,” he said. “When you’re looking at the wall, it doesn’t give you the concept of lines between the monitors because they’re so tight already.” LG’s modules can also be configured via LAN daisy chain if desired. The control room’s video wall is composed of 10 LG 55-inch super narrow-bezel LED displays, which offer 700 nits of brightness, fluid performance, and 24/7 operation. Findley believes this LED-based project echoes broader display trends in the industry. He sees the demand increasing for LED. In fact, another electric cooperative reached out to Encore inquiring about a similar setup. “Command and control spaces seem to desire LED because [it allows for] the quick showing of information.” Responding to the information is also instantaneous. In a mission-critical space, every second counts. Margot Douaihy is the editor-at-large of AV Technology magazine.